The practice of dining room etiquette is used so cruise guests can follow the proper behavior when dining. 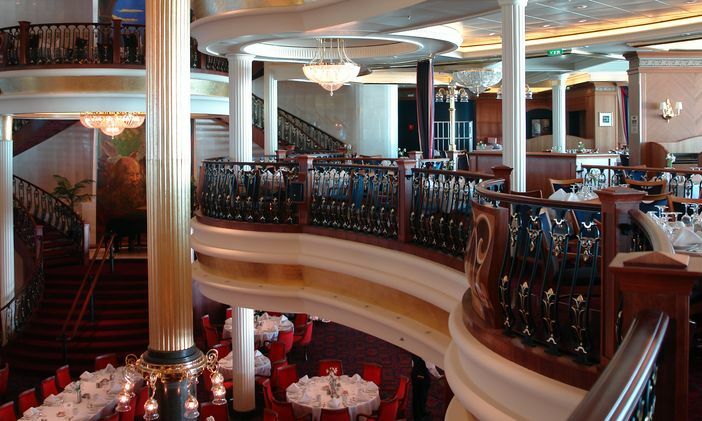 The following tips highlight the expectations of cruise lines who welcome guests in the main dining room. When practicing dining room etiquette, it is always important to wash your hands before dining or entering the main dining room. Be sure to use a hand sanitizer, as germs, such as the norovirus, can spread rapidly. Show the other guests and employees respect by wearing the proper apparel in the main dining area. Generally, guests who follow the proper dining etiquette wear casual attire when dining at night. Some invitations to the main dining room ask that guests wear formal wear. Just make sure you avoid wearing shorts and a hat. It is also important to be punctual. To arrive after the dinner begins is offensive to other diners. Proper dining room etiquette dictates that the dinner dishes are served in a specific sequence. Therefore, don’t make the error of arriving late. Otherwise, you will throw off the service of the courses. You also want to be diplomatic about where you dine and show courtesy to the people around you. In order to make sure you sit next to someone who also speaks your language, ask the head waiter to seat you and/or your party. Not only should you be courteous to the other diners, but you should also show politeness to the wait staff. Rude scowls and a show of dislike are needless in the main dining room area. Also, make sure you leave shortly after you finish eating. Permit the staff to do their work. While gratuities are usually prepaid when a cruise vacation is paid, it does not hurt to give an employee an individual tip for exceptional performance. As you can see, a cruise vacation entails following a set of dining rules as well. Keep them in mind and you will have a more pleasant holiday.